Osquery is a free open source, powerful and cross-platform SQL-based operating system instrumentation, monitoring, and analytics framework for Linux, FreeBSD, Windows, and Mac/OS X systems, built by Facebook. It is a simple and easy-to-use operating system explorer. It combines a number of tools which perform low-level OS analytics and monitoring; these tools reveal an operating system as a high-performance relational database such as MySQL/MariaDB, PostgreSQL and more, where OS concepts are represented in tabular form, thus allowing users to employ SQL commands to carry out system monitoring and analytics. Osquery use a simple plugin and extensions API to implement SQL tables, there is a collection of tables in existence ready for use, and more are being written. Some tables can only be found on a specific operating system, for instance, you only find the kernel_modules table on Linux systems. Additionally, you can run queries to monitor and analyze OS state on a single host via the osqueryi shell, or on several hosts on a network via a scheduler or execute them from any of your custom applications using osquery Thrift APIs. The Osquery can be installed from the official repository using apt yum or dnf package management tool on your respective Linux distribution as shown. Once you have successfully installed Osquery on your system, launch the osqueryi shell to start querying the state of your OS as shown. To get a summarized Linux system information run the following command. To get a well formated list of all users on the Linux system, run the following query. To get a list of all Linux kernel modules and their status, run the following query. To get a list of all installed RPM packages on CentOS, RHEL and Fedora, run the following query. To get a informatin about running Linux processes, run the following query. If you are running osquery on a desktop and have Firefox or Chrome installed, you can list all your add-ons using the following query. 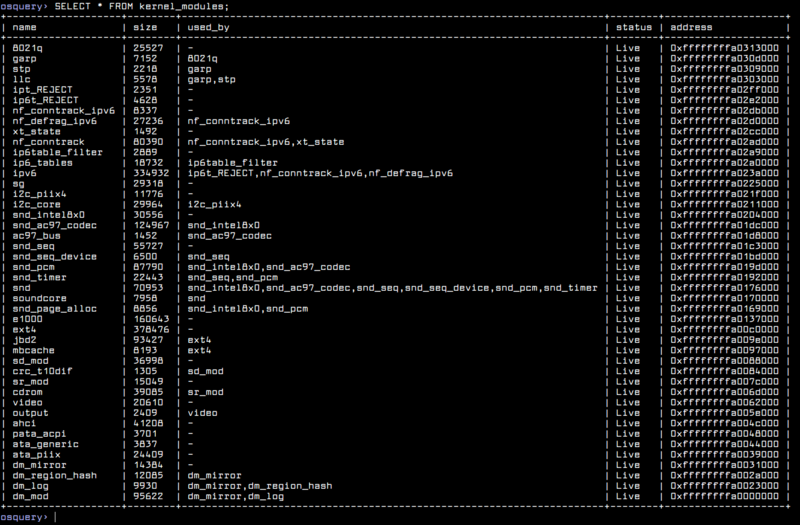 To display a list of all implemented tables in Linux, use the .tables command as shown. Osquery also provides file integrity monitoring (FIM), and process and socket auditing features and more, thus it is an intrusion detection tool, but this calls for certain configurations before you can deploy it for such a purpose. You can find more information from the Osquery Github repository. Thanks, corrected the commands for the Fedora in the article. Many thanks for appreciating this piece of work.